Elegant Artistic Luxury. That is the simple description for One Queensridge Place Las Vegas, the stunning twin tower luxury high-rise condominiums. It's located on the west side of the Las Vegas Valley at Alta Drive, one of the gateways to Summerlin. As you can see from the picture, they are magnificent eye catching creations, accented by the majestic Spring Mountains in the background, home to renowned Red Rock Canyon. In my previous news post on billionaire Phil Ruffin and the Canadian Invasion of Las Vegas, I noted this project has an international flare, and that is reflected in it's old world style. EHB Companies, whose president is Canadian native Frank Pankratz, have partnered with Tel Aviv's IDB Development to create this truly unique property. It offers the discriminating buyer the opportunity to have the high-rise luxury you'd expect to find only in a congested urban downtown, but located in an upscale suburban area. Homeowners here have the potential to wake to the awe inspiring view of the conservation area's mountain range, and entertain with views of the city lights and Las Vegas Strip. The artistic nature of the architecture is easily seen from it's exterior, but it surely doesn't stop there. It flows throughout the towers from the owners' residences to the community areas available to all in the towers. Craftsman have transformed the various natural elements into stunning works of art. From stone, tile, wood and iron, to the elegance of sparkling crystal and water, all are blended into a warm earthy feel of royal elegance. This sense is ampliphied with the world class amenities. Each homeowner has their own indoor private garage, or a garage within a garage, so to speak. Some residences offer direct elevator service from there, while all have electronically coded keys that stop only and directly at their front door. Additional privacy and security is offered by being uniform guard gated, and of course services such as valet and concierge, massage and so much more. This combined with a no tip policy by way of an annual fund, allowing for homeowners and their guests use of the abundant accommodations without reaching into their pocket at every turn. This creates a much more pleasurable and relaxing atmosphere. The quality and variety of the facilities themselves expand upon this further. In the Great Room with it's spacious design, you'll find everything from cozy areas to meet and enjoy the natural lighting by day, or the elegance and warmth of the stone fireplaces at night. You can also enjoy the media lounge, a bar and lounge, or a game of billiards. In the mornings, you can meet with your neighbors as your Barista prepares your favorite beverage at the cafe. Other features include intimate card and retreat rooms, conference room, and private 24 seat media theater. For entertaining there is a private dining area available, complete with adjacent gourmet kitchen and individual storage in the wine cellar. This provides for an excellent environment for both social and professional interaction. Three Guest Casitas are also available for family, friends, or colleagues for longer visits. Of course there's still much more. A fitness room with state of the art equipment, and from there, residents can escape to the stone and columned Roman Spa tucked away in each gender's facilities. Adjacent to them is the indoor lap pool, or you can move outdoors for a swim, or for some open-air cooking at the barbeque area. Recreation and entertainment isn't limited to the property. It sits adjacent to the Badlands, and convenient to the many golf courses in the area that you'll see in the vistas from the balconies. For other outdoor enthusiasts, hiking, biking, rock climbing, and horseback riding is all available in Red Rock Canyon. The entertainment options of Suncoast, JW Marriott and Rampart are just down the street, and the Red Rock Resort also nearby. Shopping and dining abounds in the area, and much more on the way as just across the street Queensridge has begun construction of Tivoli Village. For even more choices, and all you've come to expect from the Entertainment Capital of the World, the Las Vegas Strip is just a short drive away. Beyond the neon you can even discover the growing arts and culture and the multitude of other recreation opportunities hidden away here in the Las Vegas Valley. A wide ranging selection to suit any taste or lifestyle. One Queensridge Place offers all this and much more. While told the project is now about 70% sold at the time of my recent preview visit, there is still a selection available. These homes start at approximately 2000 square feet and different floorplans to much more than double that size. At the moment, there is very special pricing for the next ten homes that sell; please contact me for particulars. Please note: In Nevada if you register or request information online with a home builder, or first visit without your agent present, you will be giving up your right to have your own representation. 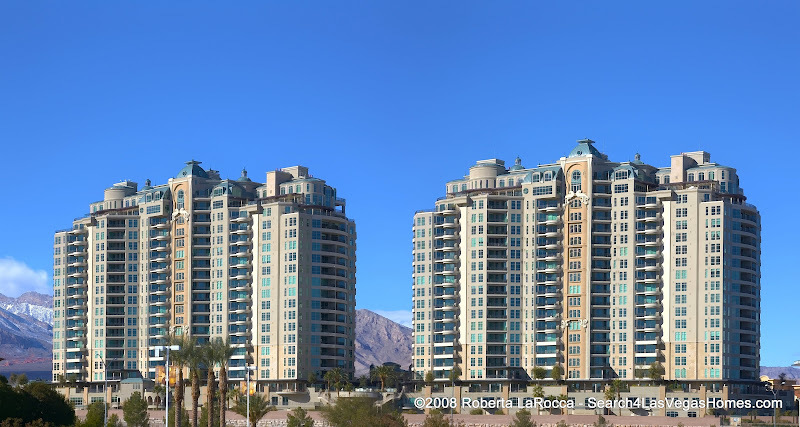 So on to pictures of this spectacular luxury high rise condominium, One Queensridge Place Las Vegas. These are a combination of the excellent pictures provided by Executive Home Builders, and my own, to provide you with an overview of this exclusive residence. To watch full screen, instead of using PLAY, click the HD / Full Screen button on the bottom of the player below, and when finished click it again or use the ESC key to return.